Adds a "2 steps/3 shots" option to the "Bracket: Single" and "Bracket: Cont." Drive mode settings for auto exposure bracketing. Adds an "Off" option to the "High ISO NR" (Noise Reduction) setting. Provides improvements in picture quality when using a high ISO setting; color noise is minimized in images captured using an ISO setting of 1600 or higher. Provides improvements to the Auto White Balance (WB), especially when taking pictures using the flash. Improves performance of the D-range Optimizer (DRO). The ability to discriminate between scenes has been improved, and the scope to which the advanced DRO effect can be applied has been broadened. Improves the ability to make a successful connection with the VG-C70AM vertical grip. Resolves an issue where the Access Lamp remains lit and the camera stops responding when several pictures are taken in rapid succession. Resolves an issue where powering the camera off while in "MR" mode may cause some registered settings to carry over to other shooting modes. 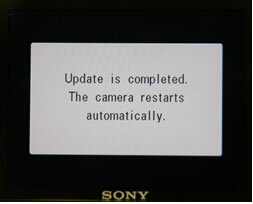 This update only applies for DSLR-A700 cameras that currently have a firmware version earlier lower than version 4. If your camera firmware version is already Version 4, then this update is not necessary. Press the MENU button and the (display) button simultaneously. A window will show the firmware version on the LCD monitor. - If a version lower than 4 is listed: Please proceed with the steps below to download and perform the firmware update. 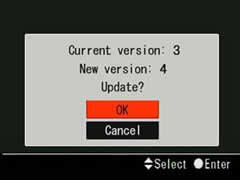 - If version 4 or higher is listed: This firmware update is not necessary. Press the Center button of the Multi-selector to close the version number display. IMPORTANT: This utility is for compatible Windows operating systems only. If you are using an Apple® Macintosh® computer please go to the DSLR-A700 Camera Firmware Update for Mac OS® page. WARNING!! : This utility is only for use with the Sony® DSLR-A700 camera. Do not install this utility with any other model. Starter editions of the operating system are not supported. 64-bit versions of Windows XP are not supported. When performing the firmware update, use a fully charged rechargeable battery pack NP-FM500H or the AC adapter AC-VQ900AM AC adapter/charger (sold separately). Note: A USB cable is necessary if your computer does not have a card slot which is suitable for the recording media. Download the DSCA700v04.exe file to a temporary or download directory (please note this directory for reference). Go to the directory where the file was downloaded and double-click the DSCA700v04.exe file to begin the extraction. At the "DSLR-A700 Firmware Ver.4" extraction window, click "OK". The DSCA700.APP file [File size: 4.50 MB] is extracted to the current directory.. Note: The file extension (APP) may not be displayed depending on your computer configuration. Prepare the recording media (Memory Stick Duo / CF card / Microdrive) by formatting it with the camera. Copy the update file to the recording media (Memory Stick Duo / CF card / Microdrive) with one of the procedures below. These procedures vary based on your computer configuration. Insert the camera-formatted media into the card slot of your computer or card reader. Copy the update file (DSCA700.APP) to the root folder of the recording media. Press the MENU button and select "Setup Menu 2" with the Multi-selector. Please check that "USB connection" is set to "Mass Storage" in the Setup menu. If it is not, please follow these steps to set it to "Mass Storage". Select the Transfer mode with the Multi-selector. Press the Center button of the Multi-selector to display the options of USB Connection. Select the "Mass Storage" with the Multi-selector, then press the Center button of the Multi-selector. 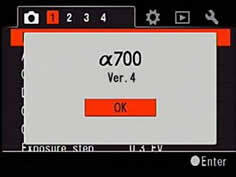 Copy the update file (DSCA700.APP) to the root directory of the recording media inserted in the camera. WARNING!! : When performing the firmware update, use a fully charged rechargeable battery pack NP-FM500H or the AC adapter AC-VQ900AM AC adapter/charger (sold separately). 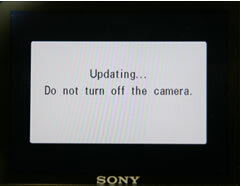 Do not remove the battery or AC adapter during the firmware updating, otherwise the camera may be permanently damaged. Slide the POWER switch to the ON position and set the "Memory card" to the type you are using for the update (Memory Stick Duo / CF card / Microdrive) in Setup Menu 2 , then slide the POWER switch to the OFF position. Press and hold the MENU button. While holding the MENU button, slide the POWER switch to the ON position. Continue to press the MENU button until the confirmation window (shown below) appears. When the "Update is completed" message appears, the updating procedure is complete. Note: The camera automatically restarts after about 5 seconds. Power off the camera, then remove the recording media. A window will show the firmware version. Confirm that the version number is now "Ver. 4". After updating the camera, format the recording media or delete the update file (DSCA700.APP) from the recording media. If the firmware version number is not 4, please download and install the firmware update again.